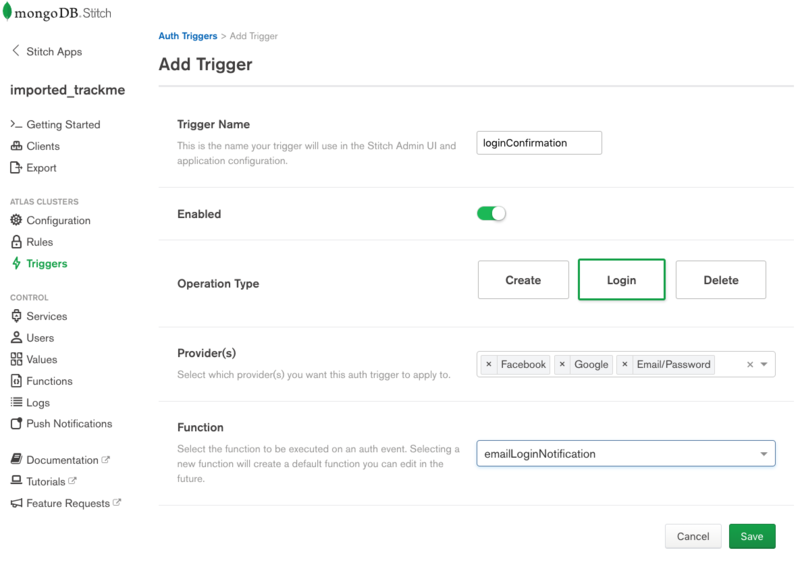 MongoDB Stitch makes it a breeze to use third-party services such as Google or Facebook to authenticate your app's users. This is great for your users as it means they don't need to go through the tedious process of having to provide all of their details to yet another application/service – it also means one less password to remember. While delegating the authentication process makes your app secure and straightforward to use, you may still want to customize the process for your users. For example, if someone is registering for the first time, then you probably want to send them a welcome email. When a user deregisters, there may be regulations (such as GDPR) that mandate you delete all of their data. Data:   "This is a message to confirm that "
+ ") has just logged into TrackMe"